Twitter Marketing: How to Be a Tweeter People Will "Follow"
Twitter marketing will work best for your business only if you are valuable to your followers. 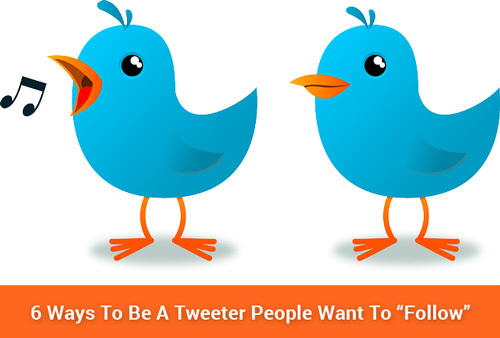 So I wrote this article to help you learn how to be a tweeter that people will want to follow. When I say "followable," I mean that your tweets are of enough value and importance to customers that they will hit that follow button. No serious person will follow anybody if your tweets are useless or appear to be spam. So here are some tips to become a "followable" tweeter. Don't focus on the numbers too much and mass unfollow. Having more followers than you're following is great. But, it defeats the purpose of social media if you are unfollowing good tweeters on purpose so as to have a bigger following number. You could lose good connections by mass unfollowing others. Be conscious of your numbers but don't let them dictate whether or not you follow a good tweeter. Be personable and have a relationship with your followers. Make sure that you retweet other followers and even answer their questions, if possible. It makes people feel closer to you when you engage them and reply to their questions. I added this tip as part of this list because building trust goes a long way. Tweeters are more likely to follow someone they can trust and know will help them out once in a while. It's considered spam when you only promote yourself, send out auto-direct messages and make repetitive tweets. Social marketing etiquette is similar to conversations with people in person. Do you usually talk about yourself all the time? Well, you shouldn't if you are. If you're doing Twitter marketing right, you will not be the only topic of your tweets. Don't schedule or post tweets all at one time. It is important to regularly tweet but it's also important to spread out your tweets. I followed someone once where when they posted, all I could see for five or more tweets straight was their tweets. Therefore it pushed other tweets farther back on my timeline. What did I do? I tolerated it for a while but finally I was fed up and unfollowed them. Do thank others for retweets and mentions. Always show appreciation for retweets and replies because it's another way to show interest in other tweeters and build relationships. Too, they have done you a favor. I do my best to see who has mentioned me and thank them. Why? (1) By them mentioning your name, website, link, etc., you are seen by their followers and others you may not have been able to reach on your own. In return this can bring in possibly some new followers or at least more traffic to your content, and (2) it shows that you care. Bonus Twitter Marketing Tip: Retweet good tweets. If you found a tweet helpful, it's likely your followers will too. So be sure to retweet good content and remember to always give credit to the original tweeter by using the "Retweet" button or RT @username. Have A Tip You Would Like To Add? If you have a Twitter marketing tip about How to be Followable, share it! You may include your twitter user name. Your tip will appear on a Web page exactly the way you enter it here. You can wrap a word in square brackets to make it appear bold. For example [my story] would show as my story on the Web page containing your tip.